I'm currently planning my pre-calc unit on logarithms and I just can't seem to find enough fun ways to drill logarithms. It really is just about practice I think, but I HATE giving students worksheets full of problems. I groan every time I see a Kuta software worksheet. I know that games basically just do the same thing in a dressed up form, but at least there's a measure of competition or strategy that gives students a focus. I just read Amy Gruen's post on practicing logarithms and almost threw out some expletives because I saw her link to logarithm dominoes and I spent a nice chunk of time last weekend to making my own logarithm dominoes. Its both wonderful and incredibly frustrating to spend hours on something then find that someone got there first and did it better. At least you know your idea was good, but you could have saved yourself so much time! (this happened to me last year with Kate Nowak's logarithm laws worksheet . I'd made one for myself then stumbled upon hers and hers was so much better!) 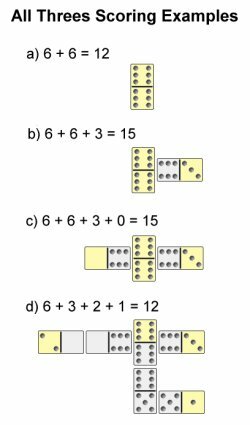 But fortunately for me, Amy Gruen's logarithm dominoes are very different from mine, so I thought I'd share what I came up with. You can build off the double domino in 4 directions- above, down, left and right. To play off a domino, you must match ends that have the same value. Players take turns placing dominoes. If a player can’t place a domino, they must draw more dominoes until they can play. After each player places a domino, count up the total of all loose ends. If the total is a multiple of 3, the player gets that many points. The game ends when either a player runs out of dominoes in their hand or when a player reaches 100 points. If a player runs out of dominoes in their hand, the player with the most points wins. Since these are logarithm expressions and not straight forward pips, players must make the conversions in their head or on paper.